When Colton Dixon was eliminated from American Idol Season 11 in 7th place, many viewers of the talent show, as well as a majority of media personalities and critics, were shocked, surprised, and otherwise baffled at his early exit from a show that has propelled the careers of artists like Carrie Underwood, Danny Gokey, Mandisa, Jason Castro, Scotty McCleary, Daughtry and Kris Allen, to name a few. Despite his earlier than expected exit, Colton still thrived, signing a record deal with Sparrow Records and releasing his debut album A Messenger in January 2013 (the album won the award for Rock/Contemporary album of 2012/13 in the Dove Awards). 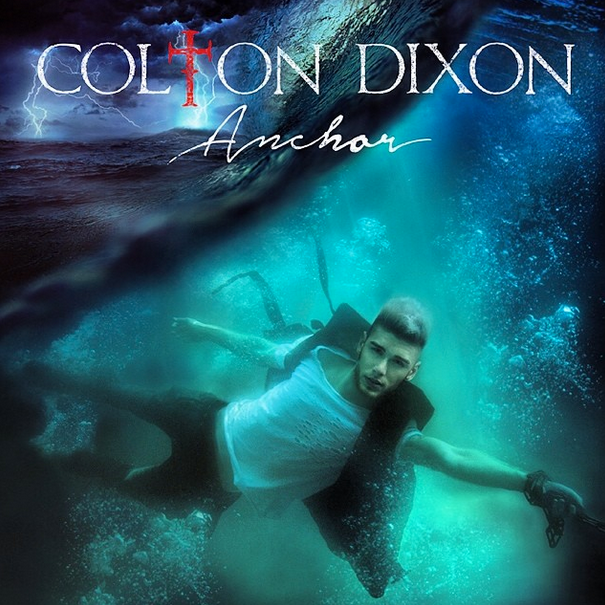 With hits like “Never Gone”, “Let Them See You”, “You Are” and “Love Has Come For Me” spanning from his debut album, Colton has once again been able to deliver to us a poignant album release in Anchor, his second album releasing August 19th 2014. Not even 2 years since he has released his first album (usually, there is around a 2 year period between albums from artists, sometimes more- except for the Newsboys, who have released an album every year, or thereabouts, since 1998); Colton has worked hard in the studio to deliver an album worthy enough for me to declare it to be the best rock/contemporary album of 2014, alongside Switchfoot’s Fading West and needtobreathe’s Rivers in the Wasteland. A must for fans of Colton’s debut, as well as similar artists like Switchfoot, needtobreathe and Chris Tomlin; and sure to be respected, acclaimed and publicised by both CCM and mainstream music industries; Colton’s career is only just beginning- and if Anchor takes less than 2 years to create, may we expect Colton’s next studio album to be at the end of 2015? Released earlier this year, “More of You” is the first radio single on Anchor, having a rock flair, similar to songs like “Never Gone”, “In and Out of Time” and “Love Has Come for Me” on A Messenger. Colton conveys the theme of needing more of God, regardless of whether we believe it or not, giving us a clear reminder that needing more of God in our spiritual lives is like needing air and oxygen, and while at times we may resist, God knows what is good for us- more of Himself. A story-song in that Colton reminds us of the Tower of Babel (shown through a children’s play in his recent music video for the song) and how ‘…I made my castle tall, I built up every wall, this is my kingdom and it needs to fall…’, we see how important it is for Christ to be in our lives, otherwise our accomplishments and achievements won’t amount to much. With powerful electric guitar and passionate vocals, Colton has given us a radio single winner, making this song one of my favourites from him ever (and arguably a standout track on Anchor!). “Our Time is Now” and “Dare to Believe” are two of the remaining tracks that have released as singles prior to release date, and just like “More of You”, occupy a rock atmosphere. In fact, much of Anchor boasts driving guitars and a powerful song line-up where its genre is comparable to that of Third Day, U2, Lifehouse or any other similar back with a rock/Christian/alternative influence. “Our Time is Now” focuses on the necessity of us to use the time we have in front of us to our advantage, and with the upbeat nature of the song, together with Colton’s enthusiastic vocals, creates a sense of urgency that is needed as we listen to arguably one of Colton’s most confronting and powerful songs to date. “Dare to Believe”, a much more radio friendly melody with hand claps and synth keyboards to being the song, tells us a story of stepping out in faith, with Colton himself proclaiming in the chorus that ‘…I will dare to believe that You are the Saviour, living in me, and I know you always will be the God of the impossible, the God of every miracle…’ With quality instrumentation, both “Our Time is Now” and “Dare to Believe” stand out alongside “More of You” as some of my own personal favourite songs on the album. Colton also offers up a variety of rock anthems in “Walk on the Waves” (a song that encourages us to walk on the ‘waves’ of life just like Peter did), “Echo” (an electronic melody that challenges us to hear God in the moments of life when we are too busy- great to hear a homage to “You Are”, even if it is just for a few seconds when Colton sings out ‘…You are the song, You are the song…’) and the title track “Anchor” (a piano prominent track with an eerie, haunting and refreshing electronic undertone, that shows a prayer to God, needing ‘…an anchor to hold me through the storm, I see the danger, can’t fight it on my own…’); while also uniquely fusing together electronic and symphonic in “Fools Gold”, where he tells us to not fall for the world and what they say for us to be happy; and showing that a piano as the sole instrument can be a good thing in “Through All of It”, a melody that encourages us in the fact that God has been with us through all the things we have been through (and everything that we will). “Loud and Clear” includes a sermon from Billy Graham, arguably one of Christianity’s most famous preachers, as the song showcases a theme of speaking up in moments where being vocal is needed. The song is described by Colton himself as “Chris Daughtry on steroids”- electronic effects galore as the enthusiasm and rock emphasis is taken to a whole new level on this track. Ending the album with three of what I reckon are the most underrated songs on Anchor, “Limitless”, a radio friendly song, discussing the limitless power of God in all situations we are in, and a potential single in the future, “Back to Life”, a rock anthem through and through as Colton relays the theme of God bringing us back from whatever state we may be in, and “This Isn’t the End”, a great anthemic moment to end the album as we are told that what we are experiencing isn’t the end- that ‘…it’s a war you’re gonna win, out of the fire, a new life begins…’; Colton continues to show us his maturity musically and lyrically, with Anchor now being propelled to being one of my favourite rock albums of 2014 so far. Colton’s songwriting skills way beyond his years (he is only 22) is reason enough to check out Anchor in a few days. A maturity in his writing and musical arrangements when comparing his forthcoming album to A Messenger, Colton’s second album on Sparrow Records is sure to receive as much praise as backlash from both the Christian and mainstream music industries. Despite this, Colton has found his niche market- CCM/rock. With a great variety of genres and styles on the album, from piano only, to symphonic rock, anthems and electronic music; Anchor takes top spot as my favourite rock album of 2014 so far, closely followed by Crowder’s Neon Steeple and needtobreathe’s Rivers in the Wasteland. Colton has shown us a glimpse of his relationship with Christ, making this album almost a shoe-in as a Dove Award nominee for Rock/Contemporary album of 2015. Well done Colton for such an empowering, encouraging and enjoyable album, and one to be listened to if you are a fan of similar pop-rock artists like Kutless, Switchfoot or Lifehouse. Enjoy listening, and be sure to pick up your copy of ‘Anchor’ in a few days. I haven’t heard all the songs on the album but for now, my favorite tracks are More of You and Dare to Believe. They’re some of my favourite songs too! I think Anchor is heaps better than A Messenger, hopefully this album will be recognised for the Dove Awards next year!